This is going to be our place to see just who is where in the state. It will come in handy when we organize meets. I will edit the list and map as soon as I see a new post.Please post with your city and county If you want to add your real name/the year/color/model Hyundai you drive thats cool too. Lets keep this thread to ROLL CALL ONLY and if you wanna chat I'll have a link to the CT Chat thread at the bottom. 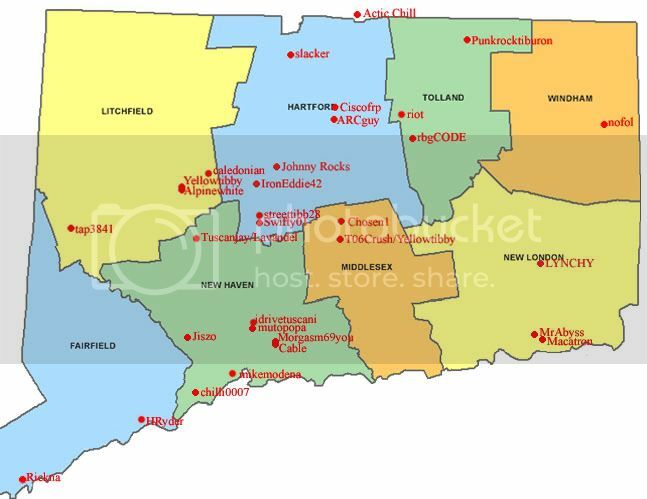 Along with Member Roll Call I will try and keep up with listing new and furture meets in the Ct area (along with places us Ct ppl have been know to represent.....ex LI). If you want to submit a meet please include the thread. You can pm me or just post here. Nolan I added you to the map and to the list. I wasn't sure about your yr so please correct me if I wrong. Michelle did a new thread since Ralph doesn't come on the site anymore. This will allow an active member to update the thread and first post. Less Than 205whp / 180wtq untuned ~2.75psi - auto power! well ive moved to stafford now, my tib is carbon blue and dayglow orange. i also have an 04 blue elantra gt 4 dr.
You should put me in Enfield, even though I'm not really. But I'm like a few hundred feet from the border. Close enough. You know you're a stupid hippie if you liked every 911 Porsche Turbo, except for the 996...bug-eyes are th3 gh3y, and so are you. Yeah, behind the Great Wall I hope. Put me down for Thomaston and Middletown since I'm at both places. there is also a person on here from cromwell which is right up the road from me. 2004 Hyundai Tiburon SE V6 6 speed. Better move me to Middlesex county. I'm now a Middletown resident. LOL - I'm already on the list ... yay. Last edited by IronEddie42; 03-06-2007 at 10:01 AM. I gotcha on here. lol no worries, we didn't forget about you! objects in a tibbs mirror are farther then they appear. I'm Rod, live in Rocky Hill and I don't own a tib, I bought an 02 RSX-S instead. '02 NBP RSX-S - Jackson Racing Supercharged @ 9psi. I'm Bruce in Terryville, CT. 2003 Rally Red I4 Turbo. 'bout time you posted up youre right next door to me. Michelle, under "events" you can link to he dyno meet and to mine..
~~2007 Volkswagen GTI DSG~~ Neuspeed Intake, blackout sidemarkers, bicycle rack. ...should I even be on this list anymore? [QUOTE=alpinewhite;1762885]'bout time you posted up youre right next door to me. Yeah I know....Better late than never. I never see any tibs on the road. I've only seen one that I can remember, it was red with vertical doors and a cf hood. That was in Bristol.